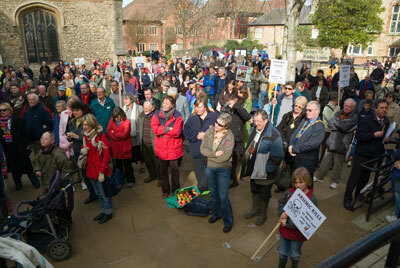 500 men, women and children* today attended a rally outside the Guildhall in Abingdon and marched to the Radley Lakes to protest about the plans by RWE npower to fill Thrupp Lake with 500,000 tonnes of fuel ash from Didcot ‘A’ Power Station. About 40 cyclists, who joined the march along its route, and a contingent of Greens dressed as frogs took part in the event, which was organised by Save Radley Lakes. Dr Harris said that it should be inconceivable that, in this day and age, waste from power stations should be dumped in this way. He said that he would personally be taking steps to try to ensure that power stations recycled their waste ash properly and not simply take, what is to them, the simplest and cheapest option. He wanted the full environmental costs of the various options to be taken into account when making choices. Basil Crowley called upon government to put an end to the obnoxious practice [of ash dumping] and ensure that all ash is recycled or kept available for future recycling. He said that curbs had to be put on the financial and legal leverage exerted by large utility corporations, since, at the moment they are out of control and not accountable to anyone except their (mainly foreign) shareholders, and are able to flout planning and other regulations with virtual impunity. 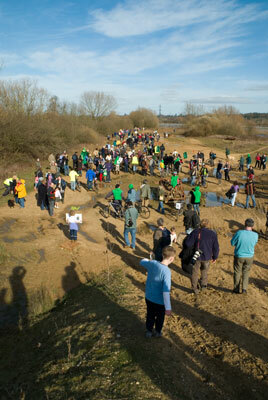 *503 marchers were counted in Barton Lane by an official teller. The march was joined at the lakes by over 40 cyclists, bringing the total to over 540. The march was also attended by a good number of photographers and journalists covering the event, who tracked the march without necessarily following the official route. staged for the benefit of the press. Yesterday, npower announced that work at the lakes has stopped because a coot’s nest has been discovered on Thrupp Lake, and, since bird’s nests cannot be disturbed when in use, work has had to cease. A likely story, as if we are supposed to believe that they care! What, we ask, about the swans and the kingfishers, whose nests were also active but destroyed nevertheless? Oh, of course, that was before the first of March, so the nests couldn’t have been in use!